This week's Bite is homemade! 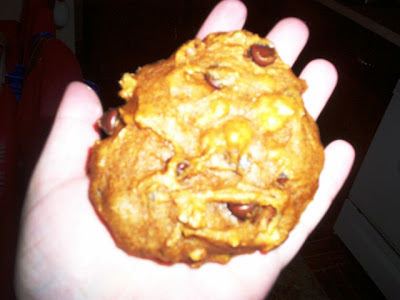 Mom found a recipe online a while ago for pumpkin chocolate chip cookies from KirbieCravings.com, who stole the recipe from AllRecipes.com. I decided to put my own spin on it and add walnuts. As I purchased the necessary ingredients, I thought that this might actually be a hard recipe to follow. I was dead wrong. It was so easy, and if I can do it, you can, too! STEP ONE: Combine pumpkin, sugar, vegetable oil, and egg. 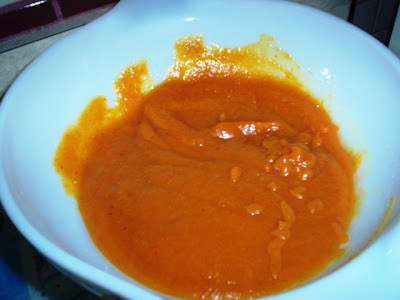 Looks like baby food, doesn't it? It smelled fantastic. 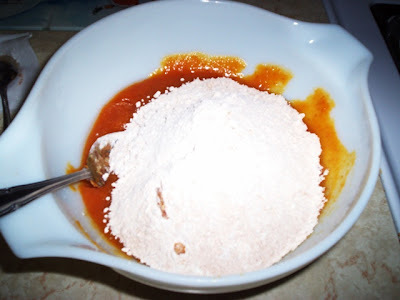 STEP TWO: In a separate bowl, stir together flour, baking powder, baking soda, ground cinnamon, and salt. Dissolve the baking soda with the milk, and stir in. Add the flour mixture (which went all over the place because dry ingredients apparently like to jump out of the bowl) to the pumpkin mixture and mix well. 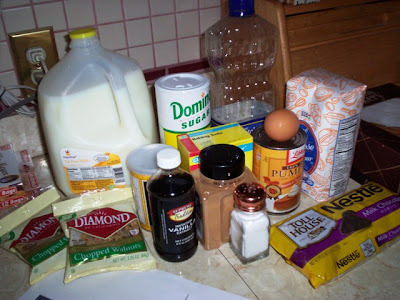 STEP THREE: Add vanilla, chocolate chips, and walnuts. Mix well. STEP FOUR: Shape and flatten dough on cookie sheet (which I covered with parchment paper) and bake at 350 degrees for approximately 10 minutes or until lightly brown and firm. Because my cookies were extra large, I had to leave them in for 12 minutes, and my second batch for 13 minutes. It was worth it; big cookies are always better than smaller ones. NOTE: The cookie dough should almost be the same size and shape as the finished cookie because the batter does not spread much. Also, it was much easier using a teaspoon to plop the dough onto the sheet than it would have been using my hands. 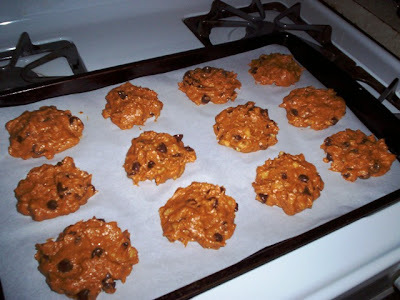 According to the Kirbie Cravings site, these cookies taste even better the second day because the pumpkin has more time to set into the dough. That is a fact! The flavor was a little stronger on the second day, but as a whole, these cookies were fantastic. THE VERDICT: Mom and Dad said that the cookies tasted like little individual pumpkin breads because of the moist, cake-like texture they had. It really didn't have any crisp at all, and it kind of reminded me of something you would eat for breakfast. 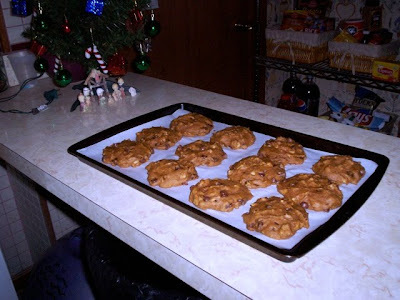 They were absolutely delicious, and adding the nuts was a very good idea (please, no applause) because it gave the cookie a slight crunch. The chocolate chips were melty and gooey - just as they should be. Mom said she hopes that I make more, and I probably will as I still have a cup of pumpkin left in the fridge. 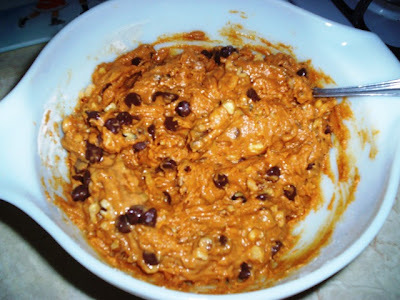 This time I'll hold the walnuts (since I don't have any) and just throw in some extra chocolate chips. Hmm ... maybe I should make them now? I'm getting hungry!